There will be no Juvenile training on Sunday 21st Feb as the coaches will be attending the Connacht Championships in Athlone. The Connacht Indoor Championships for U-12 to U19 takes place on Saturday and Sunday 20th & 21st Feb in Athlone IT. Please sign up at training by Wed 10th Feb. late entries are not possible for this event. There will be no juvenile training on 21st Feb as all the coaches will be attending this event. The curtain came down on the club challenge with the National Intermediate and Masters cross countey in Dundalk I.T. on Sunday last January 24th. While GCH had no competitors in the Intermediate race the club was well represented at master's level. Martin McEvilly competed in the M65 race and took home yet another national medal, silver this time. The County Indoor Championships take place on Sunday 24th Jan in Athlone IT. We have over 75 athletes competing from ages 9 to 18yrs. All our coaches will be attending the competition. Best of luck to all our competing athletes, many for the first time! Please check our Juvenile Facebook Page and your emails for full details of the event later in the week. The Galway City Harriers AGM will take place on Wednesdy 20th Januay 2016 at the Westwood Hotel from 8pm. Club gear will be available to purchase and refreshments will be served. We have a number of committee positions to fill this year so we would greatly appreciate your attendance this year as your ideas really count towards driving the future of the club. Training for U9-12 age groups resumes on Sunday 10th January. Please sign up on Sunday for the County Indoor Competition ( 24 Jan in Athlone) ) if you wish to compete. All athletes must be registered before entering the competition. The County Indoor Competition takes place on Jan 24th in Athlone IT. Please sign up at training before 15th Jan if you wish to compete. Athletes who wish to compete in this Competition must renew their memberships fees prior to 15th Jan. Full details of the indoor events are on the GCH Juvenile Facebook Page. St. Stephen's Day brought the, by now traditional, Fields of Athenry, flooded roads, chilly conditions and gale force winds. Actually there was no gale force wind and it showed in some superb performances. Matt Bidwell led the GCH challenge home with a fantastic sub 32 minute run and a 3rd place overall finish. Martin Kearney not only secured his first top 50 t-shirt but also ran a 10km PB for good measure. Niall Murphy also ran his best Fields yet to secure one of those sought after t-shirts. 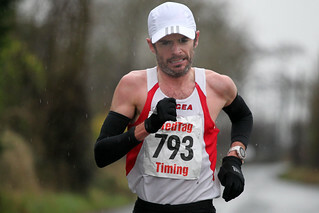 Club stalwart Seamus Coyne had, literally, the 10km run of his life to also run a PB.